Here in LA, summer just doesn’t seem to want to leave. 100+ degree weather has been the norm for the past few months. And as anxious as I am to start enjoying sweater weather, I’m grateful for the abundance of peaches, plums and pluots still hanging on for dear life. 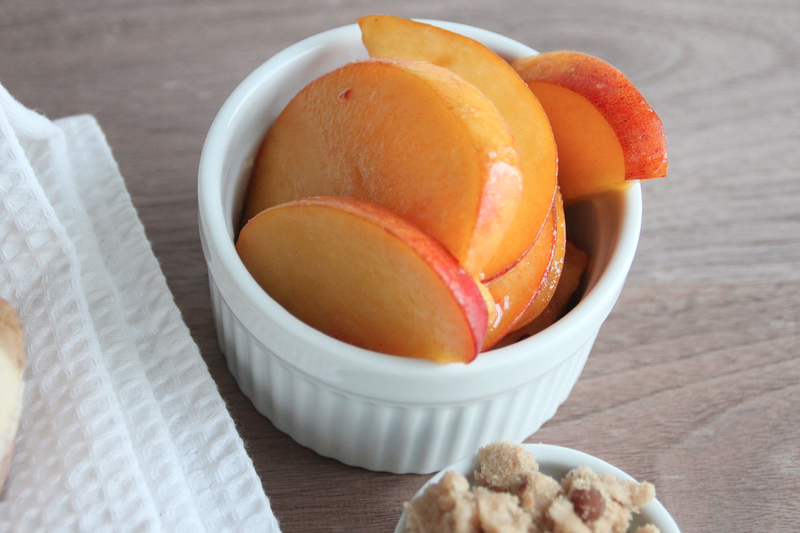 We still have a whole refrigerator drawer filled with a delicious mix of stone fruit, but this will most likely be my last peachy recipe of the year. Fortunately, this recipe is flexible – swap out the peaches for apples, pears or even quinces this fall. Happy weekend all! xoxo! Preheat the oven to 400 degrees F. Lightly Grease 24 (2 3/4-inch by 1 3/8-inch) muffin cups. Place the peaches in a bowl and cover with 1/2 cup of the sugar. Mix thoroughly. Allow the peaches to sit for 30 minutes at room temp. Cream the butter and remaining 3/4 cup of sugar until smooth and pale in color, about 3 minutes. Add the eggs, one at a time, and beat until fluffy, about 2 minutes. In a mixing bowl, combine 3 1/2 cups of the flour, baking powder, and salt. Alternately fold in the buttermilk and flour mixture, being careful not to over mix. Fold in the macerated peaches, juices and all. Spoon 1/4 cup of the filling into each prepared muffin cup. In a small bowl, combine the remaining flour, brown sugar, pecans, and cinnamon. Mix well. Add the butter. Using your hands, mix until the mixture resembles coarse crumb like mixture. Sprinkle 1 tablespoon of the crumb mixture over each muffin cup. Place in the oven and bake for about 15 to 20 minutes or until golden brown. Serve warm. Thank you! I’d love to see your blog but it doesn’t seem to be working? Let me know when it’s up again!! They look amazing! I love how big the peach chucks are. Thanks! 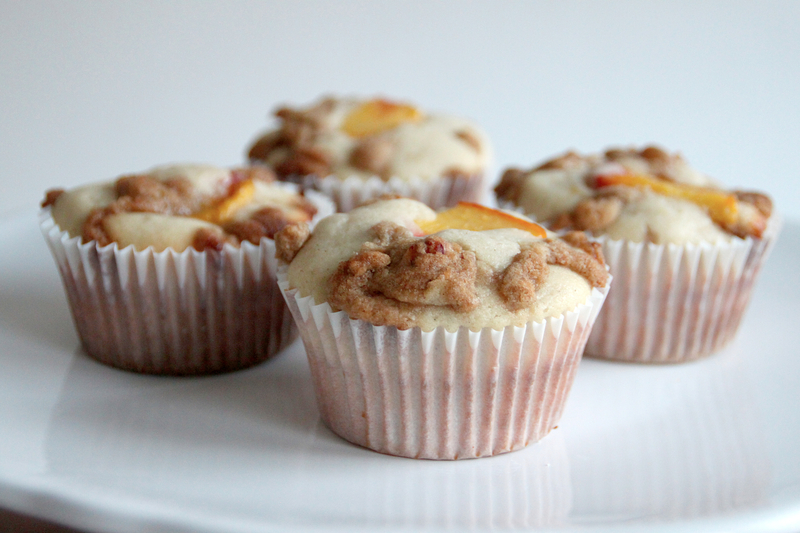 I put one big peach chunk on the top for looks but the rest of the muffin has tons of little peach bits throughout! They were pretty yummy! 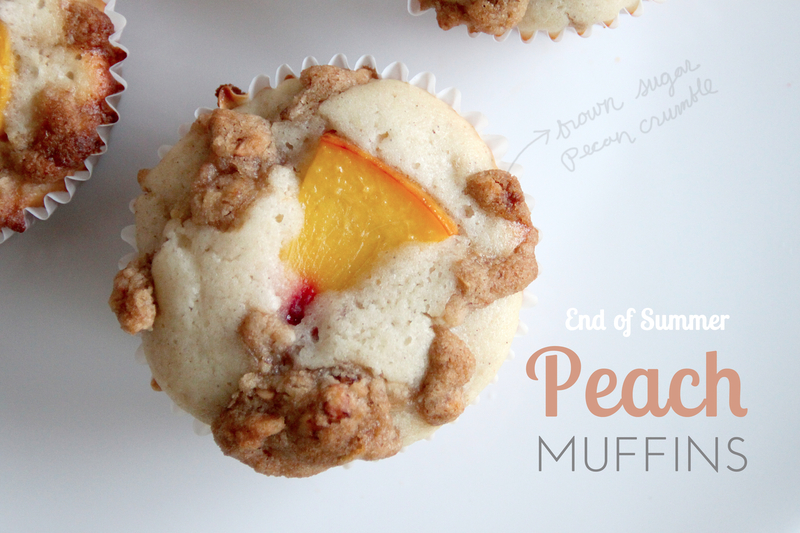 The end of Summer always make me sad, these peach muffins seems like a great way to ring out the season and ease the transition into Fall. Looking forward to more recipes! Oh my goodness! Brown sugar pecan crumble, with PEACHES? I’m not sure it gets any better. I really need to try these and soon! Ha! Yes, brown sugar+ pretty much anything is deelish!! 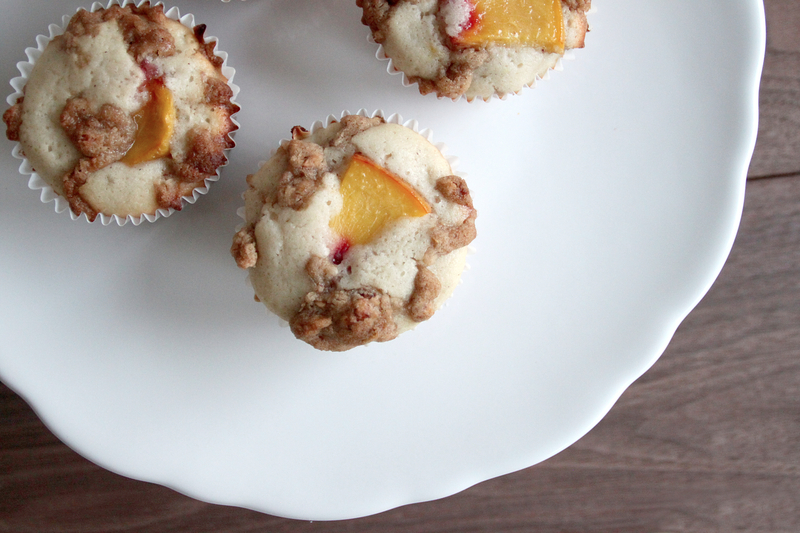 These peach muffins were pretty special, I hope you get around to baking ’em! just reading your blog for the first time and i think i’ve found a new favorite! love your photography & the fonts on your pictures. Awe!! Thanks so much! And welcome! We gotta hold on to summer as long as possible! 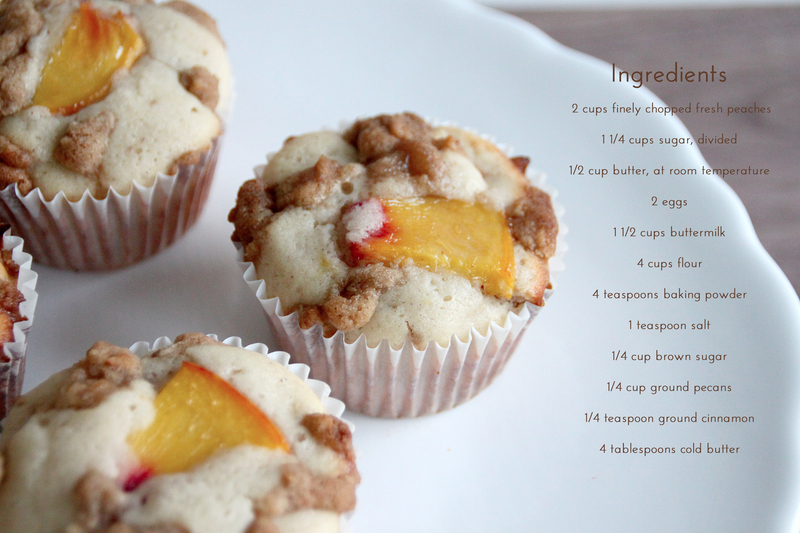 (80+ degrees in LA this weekend, psh) I just got some peaches, so def trying this recipe. Thanks! I’m in the middle of baking in this, currently, and I realized I don’t have buttermilk! Do you think I can substitute regular cow’s milk? I’m using apples for the recipe. :) Love your blog!